Have you often had guests to visit and wish that you had an extra room for them to stay in? 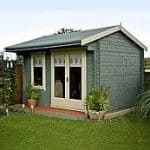 Guest quarters are just one of the things that this very versatile and very good looking garden building can be used for. 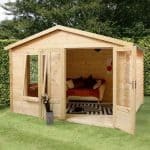 It’s the largest in the range from Palmako, makers of high end contemporary log cabins, and whilst it comes with a price tag to match it has a lot of room available that can be used for either leisure or business purposes. With our weather systems predictably unpredictable it’s reassuring to see how it has been built with this in mind. The logs themselves are considerably thicker than we normally see and it also has wind braces so that it’s ideal for siting in areas that are exposed to high winds. The tall apex roof also comes in useful, as it simply carries rain and snow away, keeping the interior dry. There are three stand alone window and both sides of the double doors are glazed in the same manner. This means that lots of light gets inside, and as the doors and windows are sealed to keep out the cold and draughts it’s a very pleasant environment to spend time in. This is one of the largest log cabins that we’ve reviewed, and it wasn’t just its size that impressed us. It’s also very attractive, being based upon a traditional Alpine design yet making the most of modern materials such as double glazing and planed tongue and groove style logs. Thanks to its size, there’s no limit to what it can be used for, so it can make an ideal home office, or perhaps a gym or spa to relax in. We especially liked the porch area in front of the entranceway which being covered by the roof is a perfect place to sit and relax on an evening. The apex roof, which is constructed of thick tongue and groove timbers that have then been topped with roofing felt, really caught our eye as it provides a useful shade giving overhang as well as adding even more height. The ridge height it creates is 2.57m with an eaves height of 2.05m. When deciding where to position it, keep in mind its base width of 5.10m and its base depth of 3.00m. We were pleased to see that 44mm thick logs had been used for the wall cladding, as this is much thicker than the cladding we usually see. The end result is a very strong and rigid structure, and as the logs fit tightly together there’s no room for water to sneak inside either. Wind bracing has been used throughout on the corners, so it has excellent all round weather protection. We were also reassured by the flooring used. 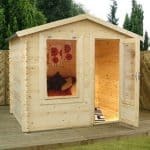 Not only is it made from 19mm thick tongue and groove, it’s also supported by floor joists that give it extra protection by elevating it above the level where ground moisture can be found. The floor joists may well give added durability to the timbers, but the lack of any preservative treatment by the manufacturer could compromise the durability as a whole. This is demonstrated by the lack of any extended warranty against rot to run alongside the five year structural guarantee. To counter this the owner will have to add their own coats of preservative. This can be time consuming but we recommend adding them almost as soon as the assembly has been completed, as well as on a yearly basis afterwards. Failure to do this could soon see rot take hold. We were very pleased with the dimensions of the double doors, as they open to a width of 1.51m and a height of 1.87m. These are both significantly in excess of the measurements we usually find on log cabin doors, and this will prove to be especially useful if you do want to bring tall or wide items of furniture inside. The upper section of the doors are glazed, which is something that we always welcome on all but security sheds, and there are three other windows as well. We liked the use of double glazing on the windows, as it ensured that the interior was not only light but also comfortably warm as well. This is enhanced by the use of a silicon sealant around the windows, so wind and rain, not to mention exterior noise, is kept out. The double glazing itself can prove to be a useful security feature, which is another reason we were glad to see it. We were even gladder to see that a key operated lock has been included as standard, as we sometimes review large and expensive garden buildings that come without any locking system whatsoever. As it is, this log cabin should provide reassurance for people who are thinking of storing valuable items inside. Whilst there are no optional extras available other than a professional assembly service, this shows just how much is already included in the standard package, other than a wood treatment option that we would have liked to see made available. 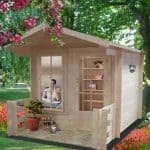 The assembly service itself could prove very useful for those who for one reason or another are unable to take on a large self assembly project, although at nearly eight hundred pounds it adds significantly to the initial cost of the log cabin. 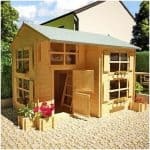 As shown by the use of very thick log cladding, amongst other things, this is a log cabin built to a very high standard. Whilst the cladding itself is both tough and durable, it’s still prone to rot due to the lack of any preservative treatment. Providing a treatment should therefore be the priority of anyone purchasing this cabin. This is a very large log cabin with a substantial internal volume, and for that reason it’s very versatile too. 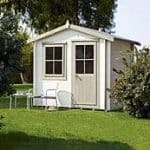 You’ll need at least one friend to help with the installation of this cabin, and even then we’d advise setting aside at least one and a half days for the task. 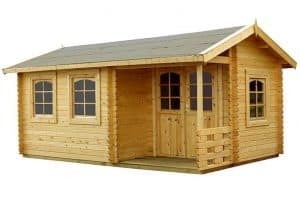 You certainly get a lot of log cabin for your money here, and a very attractive one too, but at this price we would have expected to get a long lasting warranty as well. 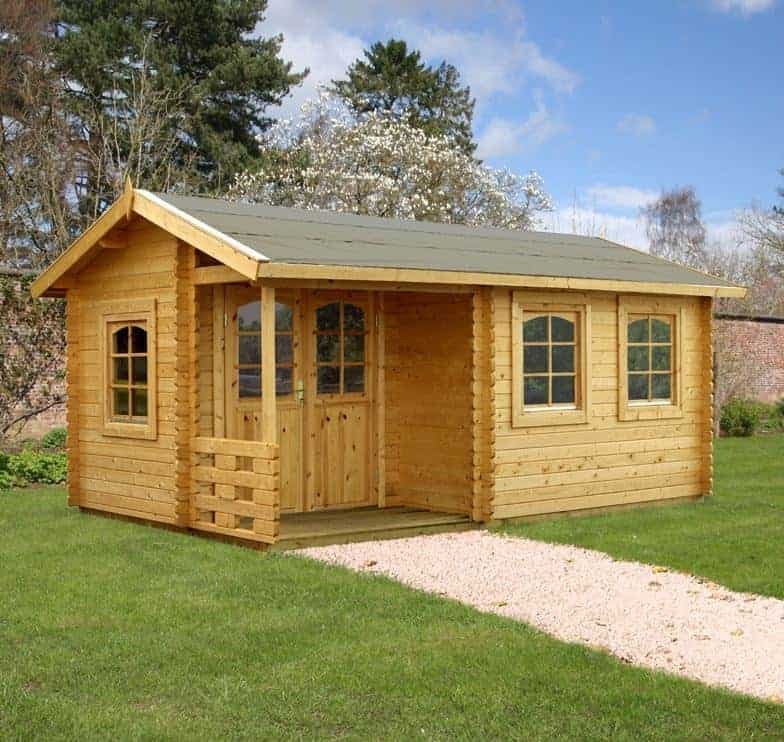 Final Thoughts: If you want a large and traditional looking log cabin for you property then this is certainly worthy of consideration, although you will have to be prepared to add wood preserver on a regular basis and at this size it can take a lot of preserver to complete a coating. Other than this, and a price tag that’s higher than many that we see, this has a lot to recommend it. We particularly appreciated its security features, as it has a key operated lock and tough double glazing on the doors and windows. Toughness is a key word that could be used to describe this log cabin, as shown by the use of reassuringly thick Nordic Spruce logs for the cladding.